Harvest time tracking software has made the admin side of our business run more smoothly. 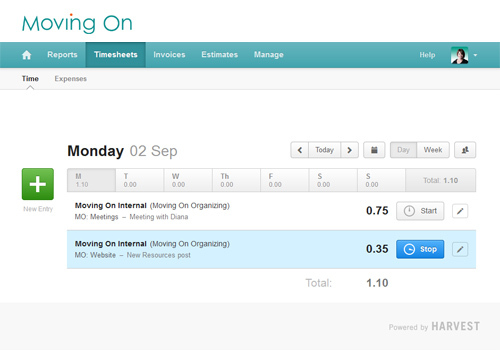 Based online with a monthly subscription fee, it tracks staff time and project expenses. We create a profile for every project and assign specific tasks and staff. Hours are entered as they are worked directly through the Harvest iPhone and Android apps. Invoices are easy to generate based on project inputs. They are professionally formatted and emailed to clients with a few clicks. Harvest is easy to use with a simple interface, and allows enough manipulation for us to customize to our needs. We started with the free 30 day trial and now can’t imagine living without it.